1 of 2 Heat a large, deep pot over medium heat; add bacon and cook until barely crisp, about 5 minutes. 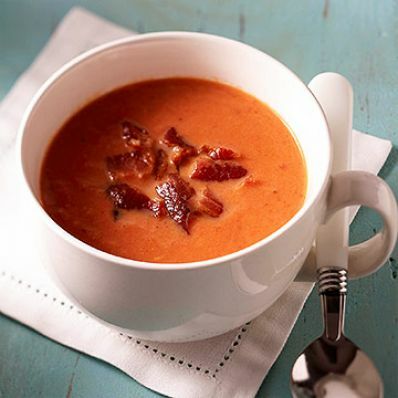 Remove bacon and reserve; remove and discard all but 1 tablespoon of the drippings. Add garlic and cook, stirring, over medium heat, 1 minute. Add tomatoes and their juice, breaking up tomato pieces with your hands or a wooden spoon. Add broth, sugar and black pepper; bring to a boil, then reduce heat and simmer 15 minutes with cover ajar. 2 of 2 Puree soup in batches in a blender or food processor. Return to pot, stir in cream until incorporated and heat through, 2 to 3 minutes. Remove from heat; stir in vinegar. Serve, garnished with crumbled bacon.